So what does that make a child with one Japanese and one foreign parent? 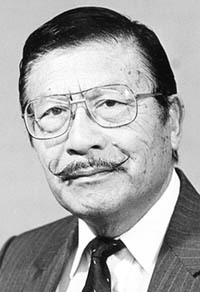 What does that make a Nisei whose parents were Issei, immigrants from Japan? From my experience, I learned about the Japanese attitude towards “gaijin,” be they Korean, Chinese or American. “This is the story of Hiroki, the son of an American mother and Japanese father. He had both a Japanese and Western name. He said his family and close friends use his Western name but after being exposed to Japanese culture, he goes by his Japanese name. When he applied for a job, he did so with his Japanese name, but since his bank account has both names on it, like his passport, he thought it was best to write his whole name in the section about account details. From his experience, Hiroki knew the bank could be very particular about names, so he thought he was doing his employers a favor by giving his full name. Little did he know that his simple action would lead to major headaches. As I mentioned in earlier, I underwent the same experience when I arrived in Japan. Those in the Japanese company that hired me came to the airport to meet and greet me. Since they saw my name as Yoshinaga, they all expected to see a “Japanese” getting off the flight at the airport. When they all greeted me and I responded with my not-so-great Japanese, they were all taken aback. One of them said, “Nan da, kare wa gaijin da.” (What? This guy is a foreigner). From that moment, I concluded life was going to be tough working for the company and it took about six months before I was able to blend in with the firm. Yeah, and it was the women employees in the firm who accepted me as one of them. This is the thought that raced through my mind when I read the foregoing story about the Hapa trying to blend in with the Japanese. Hiroki (English name: John) in the above story resigned himself to the situation and decided to look for a different job, but his parents were upset by the unfairness of the whole situation. When I told the owner that I was fed up and might quit and return to the U.S., he finally got all his employees together and said if the situation wouldn’t straighten up, he’d can those who didn’t cooperate. Well, things changed and I stayed in Tokyo for almost four years. In fact, if the guy who hired me hadn’t passed away unexpectedly, I might be writing this column from Tokyo, but unfortunately, the passing of the firm’s owner ended my stay in Tokyo and here I am pounding out a column for The Rafu. Hopefully, they learned about Japanese Americans, even though I wasn’t the best representative for us second-generation JAs. “I haven’t written to you for a while. Happy, happy? Sorry to read about your accident but happy to see you doing much better and will be able to get back to Vegas soon. “The article you printed on the Korean Spam was interesting. Although I don’t care too much about Spam, I’d like to taste their version since it sound much tastier than the American version. I’m going to our local K-Mart Korean market to see if they carry it. “The only time I eat Spam is when I make Spam musubi. However, this last time I really goofed. In the past I had no problem wrapping the nori around the rice, but this time the nori fell apart. What a mess. The nori package was marked ‘ajitsuke nori’ and was the cheaper kind you toast, cut up or tear into smaller sizes and wrap around a chopstick full of rice to eat. “I think in the past, I always used ‘nori for sushi,’ which is of a higher grade and more densely packed per sheet. Live and learn. “Getting back to your Korean Spam. You wrote that it’s more expensive, upwards of $6.10. $6.10 isn’t expensive if it’s the price on the can of Spam shown in your column. From the size of the can in the picture and the hand holding it, the can is huge and several times larger than the 12-ounce cans sold here. “Toward the right bottom of the can I can see what looks like 1.81 kg., which equals 3.98 lbs. or over five times the size of the American standard Spam that weighs 12 ounces. “Maybe the $6.10 is for the smaller similar-size can. Here I think the 12-ounce can probably runs about $2.50 on sale to about $4 regular price. Oops, I guess I forgot about rewarding the parking lot attendant who found and returned my phone. Well, I guess that’s the mentality of a newspaper columnist. Since I’m a cat lover (we have three kittens at our house) and I’m sure there are a lot of car lovers in the reader audience, including good old Maggie, I’m sure the picture I’m tossing in here will be enjoyed. 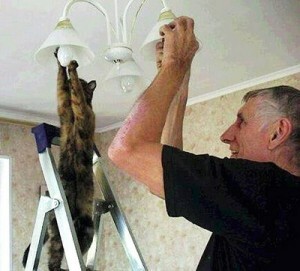 I wish our cats could replace burned out light bulbs. Heh, heh. (Maggie’s comment: Mr. Y., you already used this photo in a recent column, but it is so adorable and perhaps some missed it sooooo Meow). Thanks, Kaz. You’re right. I did write them off. Well, I hope they can continue to win and perhaps win the World Series. And I will acknowledge that I didn’t give them a chance to get so far in the title race. Hey, I’m just a broken-down newspaper columnist these days. Maybe I should have stayed in baseball when I was given a job as general manager of a pro team in the Class A California League in the City of Lodi. Since a bit earlier in today’s column I chatted about Spam, let me toss in another tidbit on dining out. In this case, sushi. It is generally accepted that sushi chefs are male, but what about females? Can they become sushi chefs? While the sushi profession is dominated by men, an increasing number of women are training to become sushi chefs. In the past, women were not allowed to prepare sushi in Japan based on the belief that their hands were too warm for the task. On a recent day, 28 students were making sushi rolls at the academy, which is located in Tokyo’s Shinjuku Ward. Eight of the students were women. The academy, which offers a systematized curriculum and training program instead of the rigors of a traditional apprenticeship, costs a student about $15,119 for a three-day-a-week, one-year course. Today more than 500 graduates are working in over 50 countries and 20 percent of them are women. Some of the women have been particularly successful after going into the catering business. One student who sees sushi as a ticket abroad is Miyabi Ikeura. “I want to visit lots of countries,” she said. She signed up for the school’s course after working at a travel agency. According to the Ministry of Agriculture, there are around 55,000 Japanese restaurants located overseas. On July 20, 1969 as commander of the Apollo 11 Lunar Module, Neil Armstrong was the first person to set foot on the moon. His first words after stepping on the moon, “That’s one small step for man, one giant leap for mankind,” were televised to Earth and heard by millions. Many at NASA thought it was a casual remark concerning some rival Soviet cosmonaut. However, upon checking, there was no Gorsky in either the Russian or American space program. Over the years, many people questioned Armstrong as to what the statement meant, but Armstrong always just smiled. Twenty-six years later, while he was answering questions following a speech, a reporter brought up the question about Mr. Gorsky to Armstrong. This time he finally responded because Mr. Gorsky had died, so Armstrong felt he could now answer the question. In 1938, when he was a kid in a small Midwestern town, he was playing baseball with a friend in the backyard. His friend hit the ball, which landed in his neighbors’ yard by their bedroom window.